Excellent mass centralization: Ultra-high rpm, 149 cc engine is one of the most advanced in the sport, its unique 4-valve, Unicam design gives it very compact dimensions and excellent mass centralization for effortless direction changes on the ground or altitude changes in the air. Rail it or whip it with confidence. Power when you want it: Short-skirted piston and light flywheel mean the CRF's willing engine builds revs very quickly - no waiting for the power to "hit". Consistent engine operating temperature: Liquid cooling and a Nikasil cylinder liner help to extend engine life. The cooling system's lightweight aluminum radiator helps to reduce weight and ensure consistent engine operating temperature no matter how hard you push. More immediate throttle: Flat-slide, FCR 32 mm carburetor is fitted with an accelerator pump for more immediate throttle response. Go ahead, use the 4-stroke advantage to grab the holeshot. 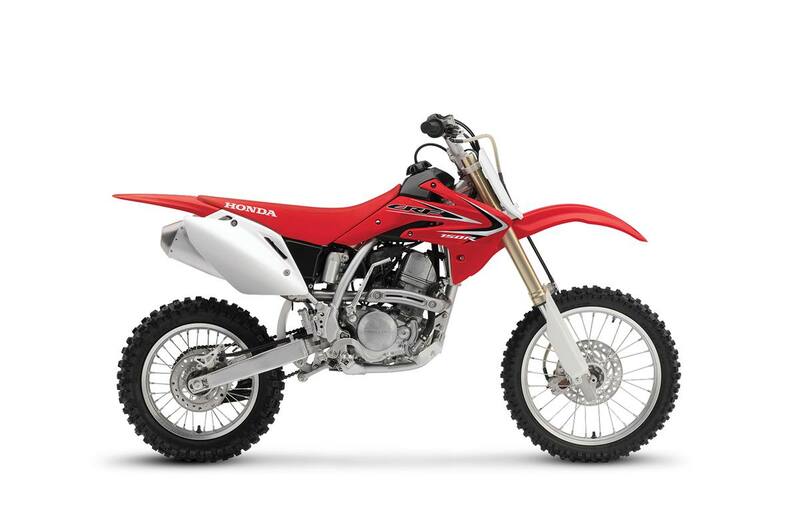 Less shifting more enjoyment: Broad 4-stroke power characteristics allow the CRF150RB to use a five-speed gearbox for less shifting so you can concentrate on your riding. Easy start from hot or cold: Although the 4-stroke engine is hard to stall, it's nice to know that an automatic decompression system makes starting easy, hot or cold. Maximum power output: Maintenance-free digital CD ignition system includes a throttle angle sensor so it can tailor the ignition curve to provide maximum power output whenever you grab that throttle. Increased durability & maximum control: Heavy-duty clutch is fitted with tough friction plates for increased durability but retains a light pull at the lever giving you maximum control. Excellent performance: Lightweight high-tensile steel frame with large-diameter tubing provides excellent turning performance and keeps you tracking straight through the whoops. Riding comfort & traction: 37 mm, inverted, Showa cartridge front fork features adjustable compression and rebound settings. The fork's low-friction design will be especially appreciated when it's helping the front wheel to follow small surface irregularities without breaking traction. Improved turning precision: Wide-section aluminum top and bottom triple-clamps hold the inverted forks rigidly and position the fork tubes far apart giving you improved turning precision and control. Comfort on any terrain: Pro-Link rear suspension system features a fully adjustable Showa shock that effectively soaks up whatever the track or trail can throw at it. Precise control over any terrain: Lightweight wheels and hubs help to reduce un-sprung weight allowing the wheels to effectively follow uneven terrain. The strong and rigid, but lightweight, box-section aluminum swingarm further enhances rear wheel tracking offering precise control whether you're braking over stutter bumps or root infested trails. Easy braking in any condition: Lightweight front and rear disc brakes with high-performance pads offer powerful, easy to modulate braking even when you're riding in the worst conditions. Consistent power: Large-capacity airbox and reusable two-stage foam air filter means power won't drop off during long, dusty rides. Stay comfortable & stay put: Slim, well-padded seat is comfortable and allows maximum movement. Non-slip seat cover gives you excellent control. Personalized comfort: Fully adjustable, high-quality controls include comfortable grips, dogleg levers, side-pull throttle and a folding shift lever. Cleated, folding, self-cleaning footpegs offering excellent grip complete the impressive collection of thoughtful touches.